In Vietnam people still use a small coffee maker made out of tin or stainless steel. This is made for an individual cup and the coffee tends to be strong, almost espresso-like. 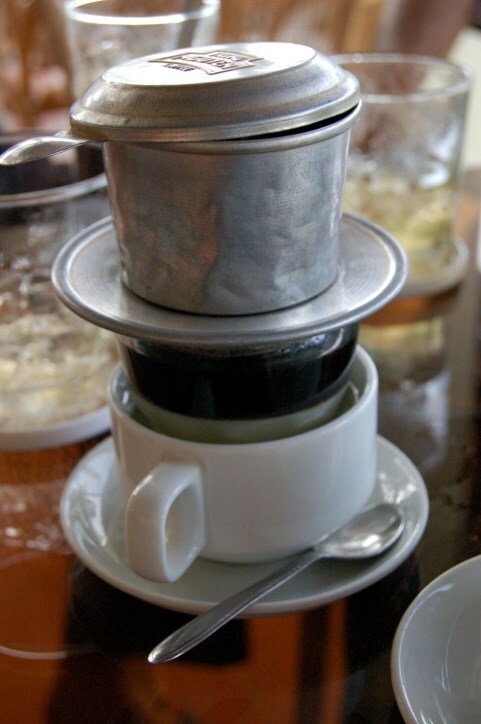 The coffee is usually served with condensed milk. This method uses a metal screen as a filter, no paper filter is used. The leftover coffee grounds can be composted in your vegetable garden. 1) Put the ground coffee on the bottom of the coffee maker. 2) Screw the inside piece in. 3) Place the condensed milk in a coffee cup. 4) Put the coffee maker over the cup. 5) Pour the water in the coffee maker. 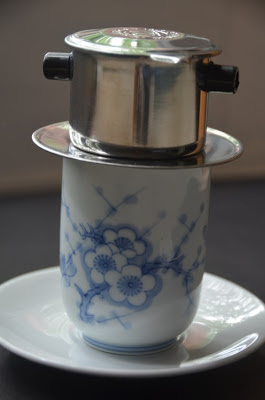 6) Place the coffee cover on and let the coffee drip. 7) The drip can take time so be patient! Once all the water is gone, take the cover off, put it on the table upside down, and use it to catch the last few drops from the coffee maker. Stir and drink! *If you buy whole roasted beans and grind them for each serving the coffee will taste much better. You can also purchase processed raw beans and roast your own. There are special coffee bean roasters that are available. 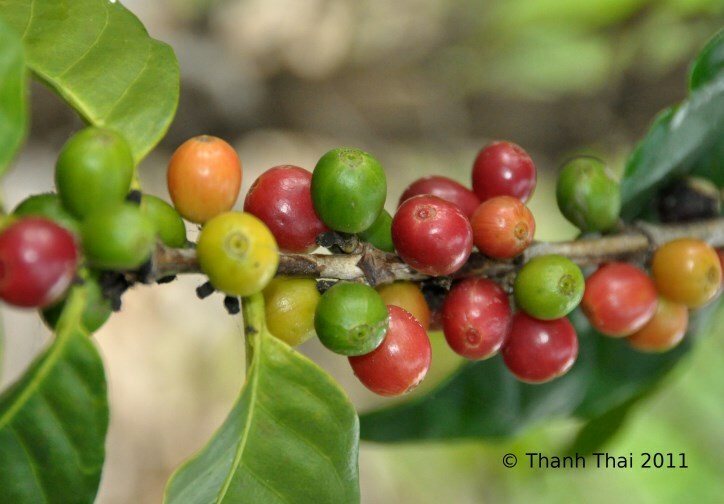 *Planting coffee shrubs/trees is not very difficult. The coffee plants need sun, water and some shade. 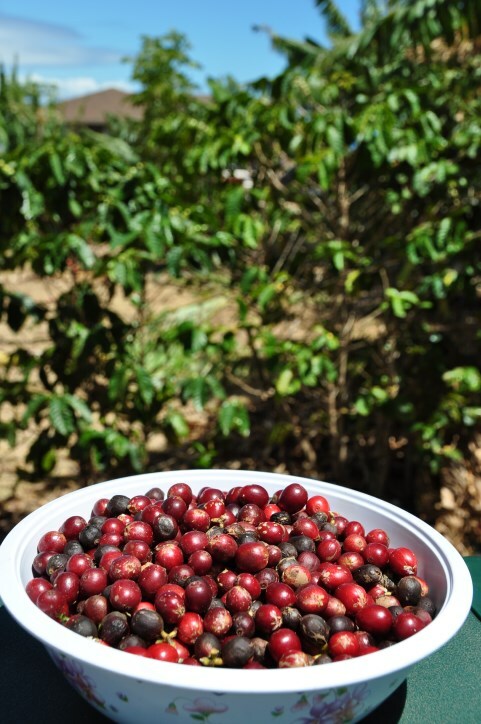 However, the process of harvesting the beans and turning them into the beans that we purchase, ready to make into a coffee drink is painstaking and hard work. You must harvest the red cherries. This is best done by picking each cherry by hand. This is followed by several steps; defruiting, fermenting, drying, shelling and more drying. Beans are sold wholesale unroasted, and are roasted locally in a range from light to dark, then ground before brewing. My husband and I harvested the bowl of red coffee beans (seen in above photo). Since I have planted coffee trees, picked the beans and actually processed them I appreciate my coffee a lot more. Every time I drink coffee I make sure to drink the last drop! *For the coffee lovers, here is an interesting article from The New York Times Magazine, This is Your Brain on Coffee with links to research studies on the risks and benefits from drinking coffee. 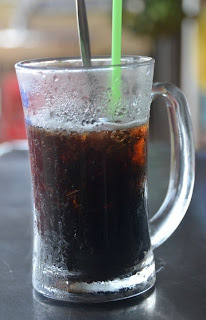 Of course as I have mentioned in past postings it is probably best to consume most food and beverages in moderation.